Ready for an instant win online keno game really bringing the party? Try Disco Keno, an action packed keno variant which allows you to play up to eight keno games at once for the chance to walk away with some huge cash prizes. Find out how and where to play Disco Keno online for real money bets using Australian dollars. Disco Keno is an online keno game following the standard keno format, while offering players the chance to play up to eight keno cards at a time. Instead of picking up to 20 numbers on the grid like you normally would, in Disco Keno you simply pick the number of cards you wish to play and the amount you wish to bet. The cards come with pre-selected numbers, similar to a bingo card. The theoretical RTP (return to player) in Disco Keno is 93.51%. If you’re unfamiliar with how to play keno, check out our handy new players guide to playing keno online. Where can I play Disco Keno for real money AUD? Disco Keno is available to play at several of the top-rated casino sites on the web. It’s available for instant-play directly over your Web browser, so you can get stuck into the action right away without having to bother with any downloads. Some online casinos accept real money deposits using trusted payment methods like Visa, MasterCard, Skrill, Neteller and Paysafecard, or alternatively, when loading Disco Keno you can click the ‘demo’ button to try this game for free in practice mode so you can get a hang for it before risking any of your own money. Unfortunately Disco Keno is not available at any of our recommended Australian keno sites. You can bet on a range of other online keno games at Lottoland and Planet Lottery. 1. At the bottom of the grid, click the arrows on the Card Price button to select the value of your wager. Cards can be purchased for $0.25, $0.50, $1.00, $2.00, $5.00 or $10.00 (if you’re a VIP member, you may be able to bet as high as $20 per card). Keep in mind you will be charged for each additional card you play, so if you choose a $1.00 card and decide to play five cards, your total bet for that game will be $5.00. 2. Now select the number of cards you wish to play, from one to eight. 3. When you’re ready, hit the play button to watch as the 20 winning numbers are drawn from the pit of 80. If you can’t stand the suspense, click the turbo button to speed the balls along. 4. All winning numbers will now be highlighted in green on the keno board and on your keno cards, with subsequent hits displayed on the paytable to the right hand side of the screen. The total you have won will be displayed on a banner and all winning money will be automatically credited to your account. How much can I win playing Disco Keno? This means if you’ve bet $10 and you land two hits, you’ll receive double your wager, walking away with $20, and so on. The higher you stake, the higher you win. 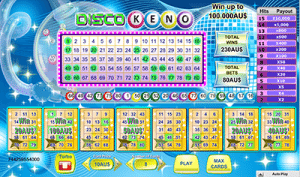 Like all variants of keno, Disco Keno is a luck based game with results which cannot be influenced by the player in any way. However, as Disco Keno gives you the option of playing up to eight games at once, there are some strategies to consider. For example, the more cards you play, the higher your chances are of landing a win, but the downside here is you’ll also burn through your bankroll faster. If you’re on a budget, consider playing the maximum of eight cards but with a smaller bet of $0.25 per card, instead of a single card at $2.00 or more. This will make your money last longer while enjoying the higher chances of winning across all cards. The key thing to remember when playing Disco Keno or any other form of keno is the results rely entirely on luck, so always bet within your means and set yourself limits so you can enjoy keno for the fun, entertaining game it’s supposed to be. 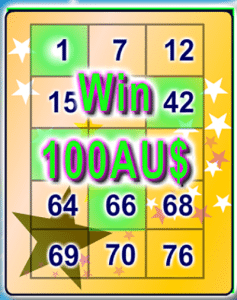 Looking for a safe place to play Australian keno games online? Check out Lottoland where there are real money games of keno to bet on every four minutes.